This article considers the framework for pesticide regulation in Western Australia, which form part of a national cooperative scheme. There are significant constitutional impediments to cooperative schemes in Australia. This article analyses those impediments and concludes that they are insurmountable for the model of co-operation that has been selected to regulate pesticides in Australia. Urgent legislative action is necessary to remedy the situation. The potential for conflicts of interest is present at the Australian Pesticides and Veterinary Medicines Authority, Australia’s national regulator that approves pesticides for sale. The Authority’s mandate is to regulate the lucrative pesticide industry to benefit both “business” and the “community”. How does the Authority safeguard against conflicts of interest in this highly contested space where other regulators have encountered regulatory capture and the revolving door phenomenon? I argue that possible regulatory capture hangs over the Authority whose priorities look clear; yet, commercial and community interests, which do not always align, compete for attention. This article relies on secondary materials to explore how the Authority manages the potential for perceived and actual conflicts of interest. Although the Authority reports no recent conflicts of interests, its historical vulnerabilities, management weaknesses and labile workforce confirm that conflicts of interest require extra vigilance, transparency and oversight to maintain the community’s trust. This article considers issues of causation for persons seeking workers’ compensation or damages in negligence for harm allegedly the result of employment-related exposure to pesticides, within the context of conflicting scientific or medical evidence as to aetiology, and the association between pesticides exposure and injury or disease. Through a case study of affected Kimberley agricultural workers, and the requirement in negligence of a “necessary condition” regarding factual causation, legal standards of proof are considered for persons alleging incapacity through exposure to pesticides. Arguably, existing standards of proof are inappropriate given the scientific and medical uncertainty surrounding the toxicity of pesticides, imposing a standard of proof that may be impossible for affected persons seeking relief to satisfy. A more beneficial standard of proof is advocated, through the notion of “social causation”, or by analogy to the “reasonable hypothesis” standard of proof for service veterans under the Veterans’ Entitlements Act 1986 (Cth). Courts have used a diverse range of scientific evidence and materials in an effort to assess liability, particularly in cases where workers or the public have lodged a legal claim for compensation subsequent on their exposure to hazardous and toxic substances. One of these commonly used scientific tools being epidemiological studies. From a legal perspective it is difficult for the courts to assess these materials. The question for our special issue being: Should epidemiological studies be used by Courts concerning pesticides issues? This article examines the laws that govern the import, export, sale and use of pesticides in Singapore. Pesticides are controlled by two separate authorities – pesticides and repellents for vectors as well as pesticides that fall within the classification of “hazardous substances” are controlled by the National Environment Agency of Singapore (NEA); pesticides for agriculture are controlled by the Agri-Veterinary Authority of Singapore (AVA). Both are regulated by laws that require these pesticides to be registered and also specify how they may be used safely. Both agencies have set out detailed Guidelines in their websites to help facilitate compliance. This article presents a review of the current pesticide laws for the manufacture, distribution and sale of pesticides in the Philippines. The Fertilizer and Pesticides Authority serves as the primary government agency responsible for the implementation of pest management measures while the Food and Drug Administration regulates household hazardous substances. Despite the presence of numerous laws dealing directly with hazardous pesticides as well as ensuring safety of consumers and environment, the risks posed by the use of hazardous pesticides in the Philippines are still high. Regulation of pesticides is highly centralised and un-coordinated. Using the integrated pesticide management framework, there needs to be stronger regulatory policies and sufficient enforcement of regulations for both household and agricultural pesticides. This article discusses aspects of the New Zealand regulation of pesticides, in the light of current concerns about global losses of biodiversity. It first briefly outlines current pesticide testing and concerns with pesticide risk assessment. Part II addresses the New Zealand pesticide laws, including a brief history of New Zealand pesticide regulation in order to provide some perspective for the following description of the current Hazardous Substances and New Organisms Act 1996 (NZ). Two case studies are provided: the regulation of neonicotinoids and chlorpyrifos. Part III discusses two key areas for improvement: the role of precaution and alternative frameworks for pesticide regulation, most notably ecosystem-based management and true ecological sustainability. It concludes that the current model of integrated management from the 1990s is now outdated. Pesticide regulation in New Zealand needs to consider a wider range of effects of pesticides on human health and the environment, be more precautionary in order to better avoid adverse effects, and take greater account of Ma¯ori values and interests. Overall, the wider role of pesticide regulation as part of the management of global biodiversity needs to be acknowledged, with it forming part of a global move to stem the loss of biodiversity worldwide. In Canada, both provincial and federal legislation cover the production, use and trading of pesticides. This causes an entanglement between all the existing norms, laws and regulations and can be difficult to comprehend. In this context, a fundamental question should be asked: do Canadian citizens benefit from a proper regulatory framework based on the precautionary approach in order to be protected from the environmental and health risks related to hazardous pesticides? This article will provide a detailed answer to that question, emphasising on the role of the precautionary approach and the importance of the constitutional division of powers in Canada. 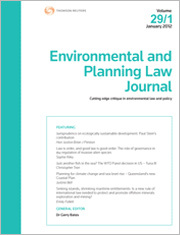 For the PDF version of the table of contents, click here: EPLJ Vol 35 No 4 Contents.